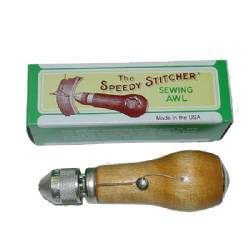 A Sewing Awl works great for harness repair or even to fix a busted footsrap. Can sew through thick tough material and make a fast, durable repair. 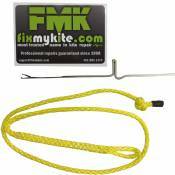 This has saved us on trips after a harness blew out from one too many uses. How Do You Use a Sewing Awl? To use a sewing awl, you must be able to reach both sides of the material you are sewing. Even if you have to work blind, make sure you can reach both sides; if you can't, you will not be able to "lock" your stitches in place. For purposes of this description, we will assume that you sew with your right hand--that means your right hand will operate the awl and your left hand will move the bottom thread. Measure out twice the thread you will need to sew your project--be generous so that you will have extra thread to tie off your work. Thread the eye on your sewing awl, and push the awl through your material. On this first stitch, anchor thread on the top side of your material by pressing the thread between the handle and your thumb. Reach under, loosen the thread at the eye and pull the unanchored end of the thread through the hole you made with the awl. Pull that thread as taut as the one on top and secure it gently with your free hand. You are now ready to begin lock-stitching. Insert the awl a stitch-width from your first hole (usually 1/8-inch away from the first hole). Use your left thumb to pull a small loop in the thread next to the eye, then use your left hand to push the bottom thread through the loop. Ease the awl back with your right hand to tighten the loop and pull down gently with your left hand to lock the stitch. Do it again--and again--that's all there is to it!